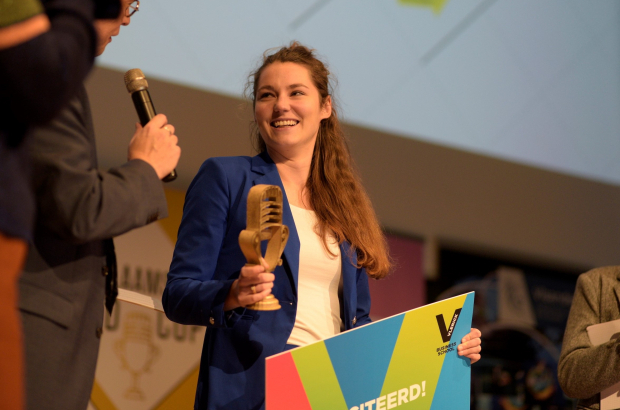 Space researcher Angelique Van Ombergen of Antwerp University (UAntwerp) has won the 2018 Flemish PhD Cup. Her three-minute pitch distilling years of research into how astronauts’ brains adapt to space travel won over the jury at last night’s final. The competition, now in its third year, challenges researchers who have recently completed a PhD to step out of the academic sphere and present their work to the general public. This involves boiling down a thesis typically running to 100,000 words, completed over four to six years, into a brief, accessible talk. First prize comprises €5,000 and membership of public science initiative the University of Flanders. Van Ombergen’s PhD was part of a wider European Space Agency project, which allowed her to collect brain scans from astronauts before and after space missions, and so look for changes. She is still involved in this kind of research, and recently took part in a simulated Mars mission at a space research facility in Poland. Second place went to Lode Daelemans, an engineer from Ghent University, whose PhD used nanotextiles to develop damage-resistant composite materials. These raise the possibility of building cars, bicycles and even windmills that are much lighter without sacrificing strength. Third place went to linguistics researcher Jolien Faes of UAntwerp, whose work involved deaf children with cochlear implants. She was able to demonstrate that these children are not only capable of learning to speak, but that they can catch up with their hearing peers by the age of five. The public prize went to Katrien Benhalima of Leuven University Hospital, for research that allows the timely detection of diabetes in pregnant women. It is the big concern how to maintain the overall glory of accessing the scholar degree. It does not matter you are studying in which subject domain.